CONTEST IS NOW CLOSED. THANKS TO ALL WHO ENTERED. WINNER WILL BE ANNOUNCED MONDAY, OCTOBER 11. 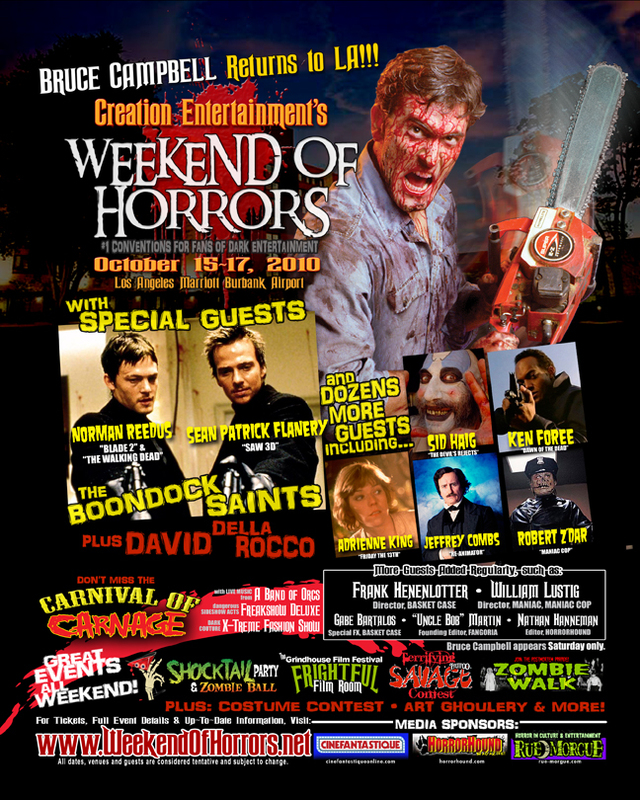 The Creation Weekend of Horrors convention is coming to the Marriott Burbank Airport Hotel for the weekend of October 15-17, with guests including Bruce Campbell, Jeffrey Combs, and more. Best of all, fans of Hollywood Gothique can win a pair of general admission passes to see the convention for free! All you have to do is send an email to us at contest@hollywoodgothique.com. Use "WOH October 2010" in the subject line, and please include your full name. The deadline for submission is midnight of Friday, October 8. Winners will be announced on Monday, October 11. Winning tickets will be available at will-call. Please bring a picture I.D. to retrieve your tickets. For more information on the convention, check out their website.